The Syfy Channel makes a lot of low-budget movies involving monsters and natural disasters. Their latest monstrosity is a movie called “Sharknado”. As the title implies, it is all about tornadoes full of man-eating sharks. When I first heard my dad talking about “Sharknado”, I at first thought he was saying “Shark NATO”, as in the North Atlantic Treaty Organization. 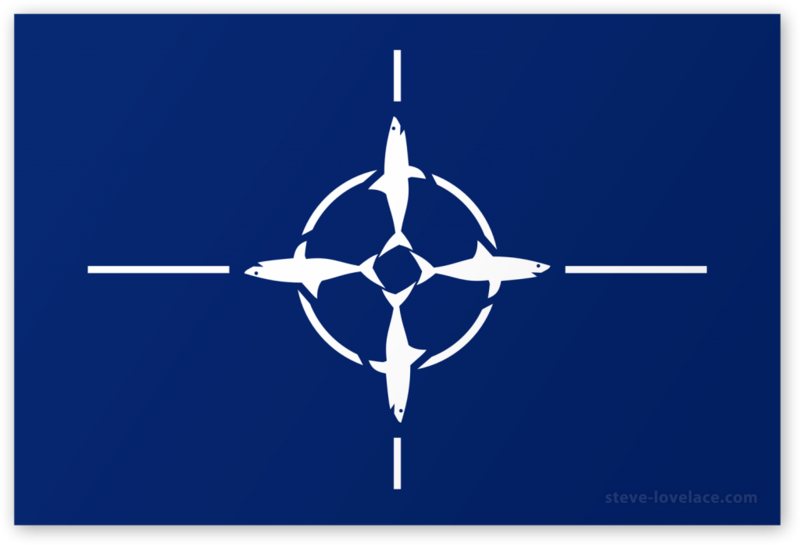 Being a flag geek, I immediately recalled the NATO flag, with its simple compass rose design. I’ve always liked the NATO flag. NATO’s founders designed it to be “simple but striking”. Their initial concept involved a series of stars, much like the later European Union flag, but they didn’t want to constantly add and subtract stars. (The EU got around this by setting the number of stars at twelve regardless of the number of member states.) A large alliance of nations does not lend itself to concrete imagery, so in the end they went with something more abstract. They started with a blue background, representing the Atlantic Ocean. To that they added a compass rose representing “the right road” to peace and a circle of unity. Thus the NATO flag was born. The creators of “Sharknado” made it as a one-off gag. They don’t intend for it to be a masterpiece. That’s the way I feel about my “Shark NATO” flag. Unlike my other flag redesigns, I don’t see much of a real-world application for this design. It doesn’t have to represent a complex international alliance. I just think it’s a fun way to celebrate a campy movie. Have you seen “Sharknado”? If so, what did you think? Let me know in the comment section. And if for some strange reason you want a Shark NATO flag on a tee-shirt or shower curtain, you can get one custom printed at my Society6 store. I may be the only other person that thought this exact same thing. I Google’d Shark NATO and realized I had it all wrong.